Local weather bureau reported that Bagyong Jenny maintain its strength and keeps moving to Northwest at 11 kph. PAGASA estimated the amount of rainfall to light to moderate and isolated thunderstorms is expected over the provinces of Aurora and Quirino. As of today's report, PAGASA seen the location of Bagyong Jenny at 965 km East of Itbayat, Batanes (1,020 km Northeast of Legazpi City) it was estimated based on all available data of PAGASA. 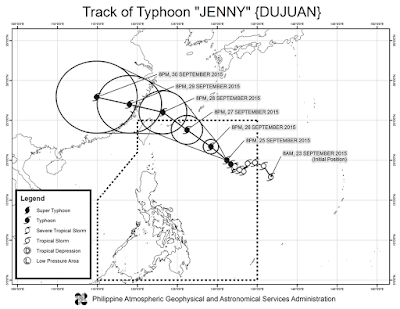 Bagyong Jenny has a maximum sustained winds of 130 kph near the center and gustiness of up to 160 kph. It is forecast to move Northwest. According to PAGASA, the Bicol region, Northern Samar, Oriental Mindoro, Romblon and Marinduque will be cloudy with light to moderate rains and isolated thunderstorms. Moderate to strong winds blowing from the Southwest will prevail, with moderate to rough seas. For more updates about Bagyong Jenny, please visit this site more often and bookmark this page. Comments or suggestions about "Bagyong Jenny Updates, Saturday - September 26, 2015" is important to us, you may share it by using the comment box below.